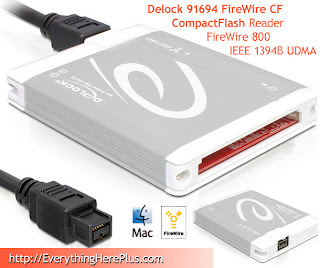 I got to spend several days testing the Delock FireWire 800 to CompactFlash Reader. It worked spectacularly with the 16GB Sandisk Extreme 60MB/S UDMA CompactFlash cards that I use in my Canon 7D. I'll be posting benchmarks here soon. 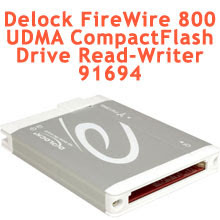 The Delock FireWire 800 to UDMA CompactFlash Drive Read-Writer is a must for pro photographers and other demanding users of high speed CompactFlash memory cards. Capable of exploiting the high speeds of the latest generation of CompactFlash memory cards, the FireWire readers 800 boasts incredible read speeds. The Delock FireWire 800 to UDMA CompactFlash Drive reader supports all the recent high-speed CompactFlash standards including PIO Modes 0-4, DMA Modes 0-2, and UDMA Modes 0-6. it features a single CompactFlash slot for CompactFlash Type I and II including Hitachi Microdrives and other CFII+ rotating media. 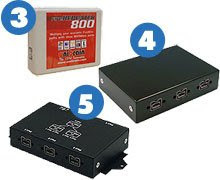 It supports FireWire 800 (and 400 with and optionally purchased adapter or cable) connectivity on both Macintosh and Windows Operating Systems. The FireWire 800 to CompactFlash uses FireWire bus power, so the CFFire800 reader plugs and plays with no external AC power. The Delock FireWire 800 to CompactFlash Drive requires no drivers and comes with a one year limited warranty.